2015 marked yet another busy year for the pensions industry. We still await the first move upwards in UK interest rates and the effect of an economic slowdown in China – though many developed countries would give much to share China’s current slower rate of growth! This time last year, I said that the macro-economic crystal ball had clouded over; it remains gloomy and headlights are needed. Investment is still tricky with many growth assets classes showing rather anaemic performance. The pensions freedoms April 2015 deadline came and went and many providers are still formulating what they are able to offer their clients and beneficiaries. At the NAPF/PLSA conference, the new Pensions Minister suggested that new development in many areas of pensions might be put on hold in order for us to focus on the wider auto-enrolment – this seemed to receive a warm reception (or at least, a sigh of relief). For this posting and for my e-cards, I’m once again using pictures from my nieces Melissa and Isabella. 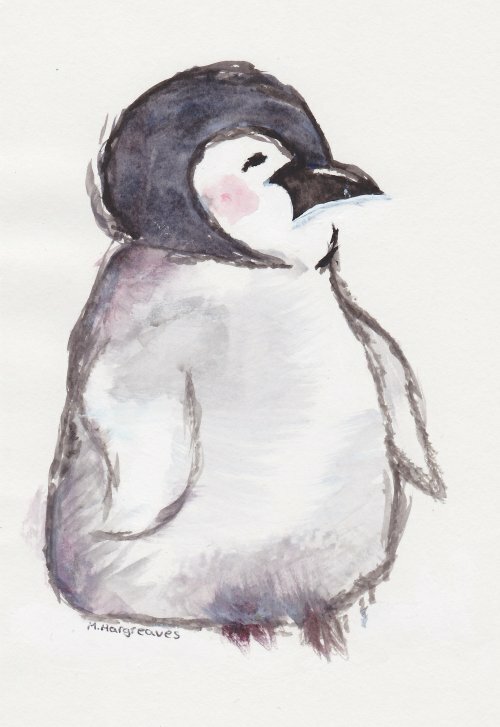 This design is titled ‘Penguin’ and was painted by Melissa. A complete gallery can be found here. We all hope that you enjoy them. I would like to thank clients, friends, contacts and readers for your support during 2015 and look forward to a peaceful and prosperous 2016 for all in the pensions industry.